We are still getting frequent inquiries regarding the Full Section Opening feature. It’s time for a little refresher. 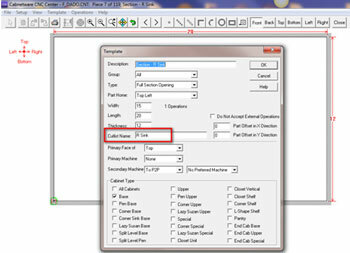 Remember, the concept is to assign a cabinet section a specific name that will link to the Cabnetware CNC Center templates to produce machining based on the name. Here are a few examples of the usefulness of the concept. Here is a frame cabinet recessed sink knee section. 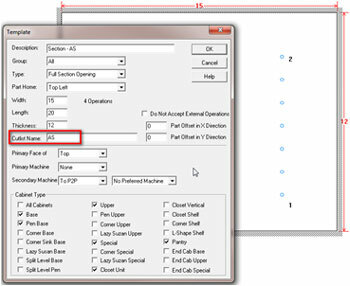 Highlight the section and choose Section Name from the <RB> menu. Assign a name. The name isn’t important as long as it makes sense to you and matches up with the name used in CNC. 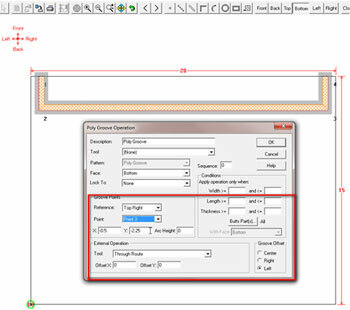 In the CNC Center, create a Full Section Opening part template. 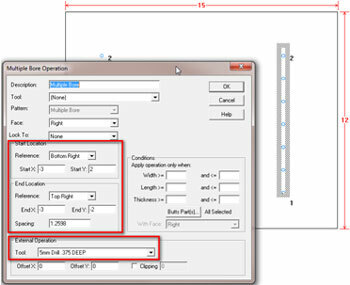 Put some nominal values in for the Width, Length and Thickness numbers. The Full Section Opening can be looked at as a box that fits in the opening and occupies the interior of the cabinet. 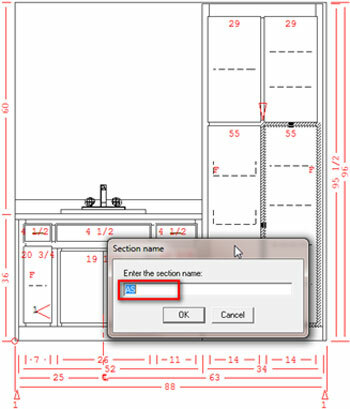 Assign a Cutlist Name to the template that will match the name that was put on the Full Section Opening in the room design. Put the operations on the template part that you want be machined. 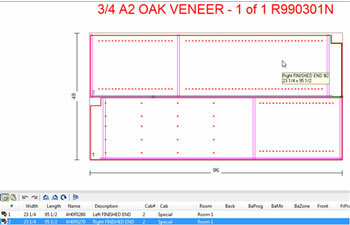 In this case I put a through cut that will resize to match the various sized recessed sink cutouts in different rooms. Pay attention to the reference points on the operation. This poly groove operation is on the bottom of the opening template so it gets transferred to the cabinet bottom. Another common example would be for continuous line boring in CNC. 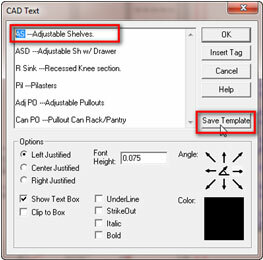 In this case I assigned a section name of AS for Adjustable Shelves. One easy way to keep track of your list of common section opening names would be to create a saved text block with names and descriptions. Then just copy and paste the names to the section openings. The continuous line boring for shelves would look something like this. 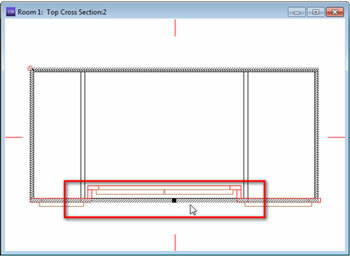 Reference the start and end points of the multi bore External operation from opposite ends of the Full Section Opening template. This will give you more or fewer holes depending on the opening height. The results are below with a S2M Center nest. The Full Section Opening feature is available in all the Cabnetware Manufacturing programs since V 8.3.